Preheat oven to the temperature specified on your cake mix. Spray one 13x9-inch pan with cooking spray, or you can split this into two smaller pans. Make and cook cake as directed on your cake mix box for a 13x9-inch pan. With handle of a wooden spoon poke evenly spaced holes almost to bottom of cake, about 1/2 to 1 inch apart. If you wipe the wooden spoon handle in between it will help stop it sticking and pulling out lumps of cake. In a bowl mix together the milk and banana pudding as directed on the pudding packet. When the cake is fully cooled pour mixed pudding over the cake and spread evenly over surface to get it into the holes and fully cover the surface of the cake, then refrigerate for 1 hour, this will allow the pudding to set enough to easily add the whipped topping. Spread whipped cream or whipped topping evenly over the pudding layer on the cake. Just before you serve it add crumbled Nilla wafers and then sliced bananas over the top, the bananas will turn black if you cut them too far ahead of time. 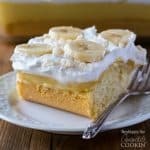 This recipe for Banana Pudding Poke Cake was printed from AmandasCookin.com - https://amandascookin.com/banana-pudding-poke-cake/ and can only be printed for education or personal use.